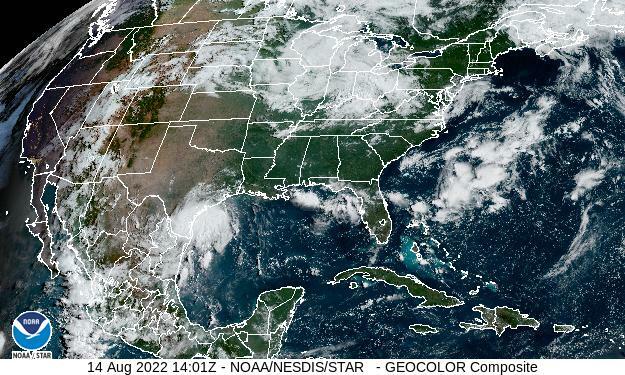 Synopsis: A vigorous spring storm in the southern Plains and associated cold front will then move through the north central Gulf coast overnight. 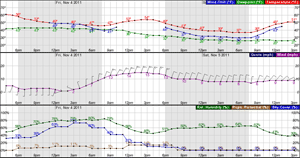 Winds will diminish on Friday and Saturday. S wind 20 to 25 kt becoming WNW after midnight. Winds could gust as high as 30 kt. A chance of showers and thunderstorms before 1am, then a slight chance of showers between 1am and 2am. Some of the storms could be severe. Patchy fog before 9pm. Seas around 4 ft.
WNW wind 15 to 20 kt, with gusts as high as 30 kt. A slight chance of showers after 1pm. Seas around 4 ft.
NW wind 15 to 20 kt. Mostly clear. Seas 3 to 4 ft.
WNW wind 10 to 15 kt, with gusts as high as 20 kt. Sunny. Seas around 3 ft.
WNW wind 5 to 10 kt becoming WSW after midnight. Clear. Seas 1 to 2 ft.
S wind 5 to 10 kt. Sunny. Seas 1 to 2 ft. SE wind around 10 kt. Mostly clear. Seas around 2 ft. SE wind 10 to 15 kt. Sunny. Seas 2 to 3 ft.
ESE wind 5 to 10 kt. Partly cloudy. Seas 1 to 2 ft.